Men and women can react to parenthood so differently. We are all thrilled with our beautiful babies, but becoming parents can change us, and our spouses, in some unexpected and occasionally incomprehensible ways. The once charming and delightfully witty wife morphs into a control-freak, bottle-wielding shrew. The once perfect and ever-so-helpful husband often seems to be looking for the nearest escape hatch. It can start to feel like you are gazing at each other across a great chasm, rather than bonding over the experience of raising your child! But take heart, because many of your spouse’s new and incomprehensible behaviors are normal. In fact, there are plenty of good reasons behind them, like the "small matter" of the propagation of the species! It’s instinct, pure and simple. When we become parents, our most basic nurturer/provider instincts rise to the surface. And at times, these hardwired biological impulses can seem to push you and your spouse in different directions. Most women we spoke to said the transition to motherhood was mind-blowing and life-altering. There’s no avoiding the power of the maternal instinct. Whether we work or stay home, when we have a baby, a nurturing domestic gene is activated. It’s as if a Mommy Chip is implanted in our brain. Once triggered, this chip hums 24/7. It drives, what men refer to as, “Crazy Mom Behavior” (you know -- researching colic/strollers/pre-schools at 3 o’clock in the morning, or bringing the baby’s blanket to work with us so we can smell it during the day.) The Chip contains a Worst Case Scenario program that feeds a mother’s fears (“let me just make sure the baby is breathing”) and is plugged into a Guilt Circuit that makes us constantly question whether or not we are doing enough for our children. The Mommy Chip is a good thing, biologically speaking, but a bad thing in the sense that it can make us compulsive about doing everything just right. 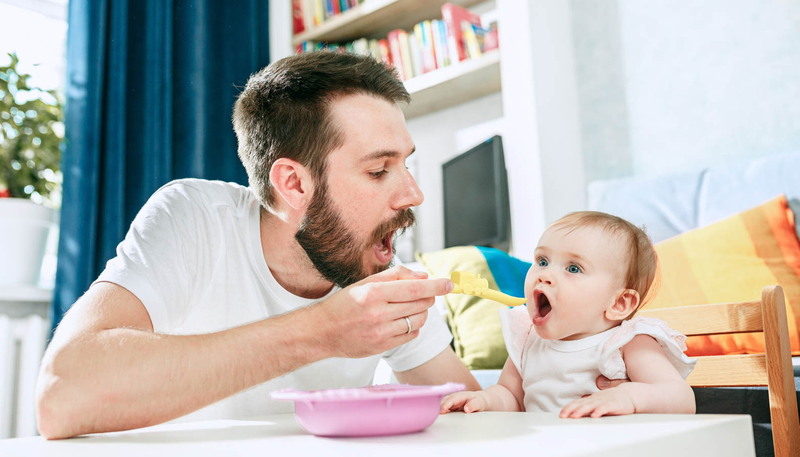 In many respects upon becoming fathers, men don’t feel all that differently than women. They, too, feel great love and fear. They, too, want to do their best for their children. But they don’t have a Mommy Chip, so they don’t get obsessed. What they do feel, however, is a sort of Provider Panic. Even if they are one-half of a dual-income household, most men told us they believe that providing for the financial well-being and stability of the family is their responsibility. Not because they are closet chauvinists who are threatened by their wives’ earning power or self-sufficiency, but because they just can’t help it. This phenomenon often sparks a laser-like focus on work. Career and financial success become more important than ever. Men’s compelling drive to provide can compromise their ability to see what needs doing (and sometimes even to enjoy what’s happening) on the home front. There’s no mental room for noticing the bottles need washing because the male brain is already in high gear calculating college tuition payments. These different and not always complementary instincts can set the stage for some serious conflict. Women get upset because their husbands seem to be one step removed from the work and are not nearly as focused on the baby as they are. Meanwhile, many a new dad, caught in the grips of Provider Panic, gets frustrated when his wife tells him he’s not doing enough on the homefront because he feels like he’s working harder than ever at his job. Furthermore, a lot of men feel ignored by wives who are obsessed with the baby. In their minds, their wives create unnecessary work and stress by trying to meet ridiculous standards of parenting perfection. He’s not wired the way you are. He doesn’t have a Mommy Chip. Don’t worry if your partner doesn’t share your interest in the baby paraphenalia, or that he’s not as baby ga-ga as you are. His love for his child is no less than yours, even though he might not notice that the baby has a new tooth. Recalibrate your expectations. Wanting your husband to do his fair share (and maybe, just maybe, to “see what needs to be done” and do it without being asked) is a perfectly reasonable expectation. Wanting him to respond on cue to every emotional nuance you feel and match you coo for coo is probably an unreasonable expectation, given that he is, in fact, a man. If, however, your husband is one of those men who just doesn’t get it, or he makes comments like “Why is this so hard for you?” it might be time to give him a Training Weekend. Take off for 48 hours and let him man the kid and house ropes on his own. No backup. No sitters. No dialing 1-800-Grandma. After two days and nights of solo parent duty, never again will you hear him say, “What’s the big deal about taking care of a baby?” It also helps you realize you can let go of the reins. You’re a great mom, even if the beds don’t get made or the children wear the same clothes for days in a row. Fight the impulse to do everything perfectly, or indeed, to do everything yourself. We’re not advocating domestic chaos, and we don’t think this attitude should prevail when it comes to major stuff like health and safety, but what about the minor stuff? Will your kids remember that you stacked the diapers in the thing just so? It’s OK to relax your standards a little. In fact, it feels really, really good. Your husband won’t do things the way you to them, but, assuming he has all his faculties, he can do them. For most of us, motherhood is a trial-and-error/baptism-by-fire education. We learn as we go. But if we stand over our husband as he tries to identify the front end of the diaper, or constantly critique his bottle-warming abilities, how will he learn as he goes? Take a step back and let him figure it out for himself. We can inadvertently turn ourselves into the Maternal Gatekeeper. If you want him to be a partner, not a helper, try giving him some breathing room. Yes, the baby needs you, but your husband still does, too. Don’t cast him aside like yesterday’s meatloaf. We’re not talking about cooking him a gourmet dinner after you’ve been up all night nursing. He’s probably just feeling a little vulnerable (just like you are), and the simplest gestures of affection are all he really needs. New moms need empathy in spades. We worry constantly that we are not good enough mothers. We are filled with self-doubt. The “I can’t do this” feelings can be overwhelming. More than anything else, your wife needs to hear “you’re fantastic, “you’re amazing at this,” and “(insert baby’s name) is lucky to have you as a mom.” You need to be her one-man pep squad. She desperately wants you to understand how much her life has been upended by motherhood. Just telling her how much you appreciate all her work will go a long way towards bridging the divide. She can’t help it if she gets a little obsessed and starts stockpiling bananas and diapers like Armageddon is just around the corner. And, certainly, she’s not trying to leave you out on purpose. The baby really does need her. Don’t get carried away with the She-Has-Forgotten-About-Me-Forever line of thinking. You can, after all, feed, clothe and bathe yourself. But if you’re feeling completely neglected, it’s important to have a heartfelt conversation with your wife about it. If you’ve ever thought to yourself, “what’s she complaining about, it can’t be that hard.” Then see if you have what it takes to do it yourself. Think of it as a 48-hour Navy SEALS crash course in the basic skills listed above. It will give you a new appreciation for your wife, and, importantly, an opportunity to bond with the baby on your own terms.